“He Leadeth Me: O Blessed Thought,"
“He Leadeth Me” by American Joseph Gilmore (1834-1918) was birthed out of a particular struggle in American history. This hymn was composed in 1862 during the Civil War, a time of upheaval and insecurity. The author was preaching at First Baptist Church in Philadelphia soon after his ordination. Dr. Carlton R. Young, The United Methodist Hymnal editor, cites Gilmore’s recollections on the hymn's formation: “I set out to give the people an exposition of the 23rd Psalm, which I had given before on three or four occasions, but this time I did not get further than the words ‘He Leadeth Me.’ Psalm 23:2, ‘he leadeth me beside the still waters,’ became the theme of the song” (Young, 1993, 390). 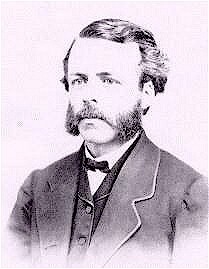 Joseph H. Gilmore, the son of Joseph A. Gilmore, governor of New Hampshire, received his education from Phillips Academy, Andover, Massachusetts, Brown University, Providence, Rhode Island (1858), and Newton Theological Seminary (1861) where he taught Hebrew. An ordained Baptist minister (1862), Gilmore became a professor after serving churches in Philadelphia, New Hampshire, and New York. He was also a professor of English at the University of Rochester from 1868-1911. A prolific writer for newspapers and periodicals, Gilmore also authored three books in his academic field: The Art of Expression (1876) and Outlines of English and American Literature (1905), as well as a book of poetry, He Leadeth Me, and Other Religious Poems (1877). Or note “Blessed Assurance” (1873) by Fanny Crosby (1820-1915), in which the poet says: “Perfect submission, all is at rest, / I in my Savior am happy and blest...“ (stanza 3). As is the case with so many gospel songs, the rhetorical strength of this hymn lies in the almost incessant repetition of a single thought: “He/God leadeth me.” When the five quotations of this idea in the four stanzas are added to the three references in the refrain, the singer will have sung “He/God leadeth me” a total of seventeen times by the time the hymn is concluded! Gilmore seems to have had a humble nature as a poet and lacked ambition in promoting his own work. After handing the draft of the poem to his wife who sent it to The Watchman and Reflector under a pseudonym, Gilmore thought no more about it. Gilmore notes, “Three years later I went to Rochester, New York, to preach as a candidate before the Second Baptist Church. Upon entering the chapel, I took up a hymnbook, thinking, ‘I wonder what they sing.’ The book opened up at “’He Leadeth Me,’ and that was the first time I knew that my hymn had found a place among the songs of the church” (Osbeck, 1982, 87). When the famous musical evangelist Ira D. Sankey (1840-1908), the musician for renowned evangelist Dwight L. Moody (1837-1899), included Bradbury’s version of the hymn in several editions of Sacred Songs and Solos, its fame was assured. The Salvation Army spread its use throughout Britain when they included it in several of their collections. Though Gilmore wrote other hymns, it is this hurriedly penned text written at age 28 for which he is remembered. The First Baptist Church of Philadelphia was demolished in 1926. Kenneth Osbeck notes, however, that the words to the first stanza of Gilmore’s hymn appear on a bronze tablet on the large office building that replaced the church with the inscription, “in recognition of the beauty and fame of this beloved hymn, and in remembrance of its distinguished author” (Osbeck, 1982, 88). “He Leadeth Me (Gilmore)” Accessed October 31, 2017. http://www.hymntime.com/tch/htm/h/l/e/hleademe.htm. Osbeck, Kenneth W. 101 Hymn Stories. Grand Rapids: Kregel Publications, 1982. Watson, J. R. and Carlton R. Young. "He leadeth me! O blessed thought." The Canterbury Dictionary of Hymnology. Canterbury Press, accessed October 15, 2017, http://www.hymnology.co.uk/h/he-leadeth-me!-o-blessed-thought. Young, Carlton R. Companion to The United Methodist Hymnal. Nashville: The United Methodist Publishing House, 1993. C. Michael Hawn is the University Distinguished Professor Emeritus of Church Music, Perkins School of Theology, Southern Methodist University, Dallas, TX.